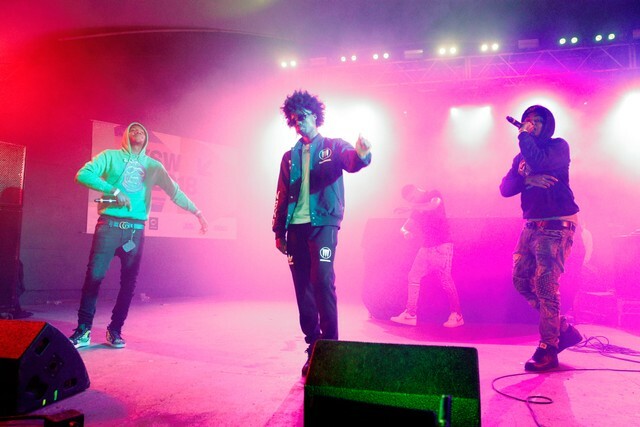 Bay Area rappers SOB x RBE have released a surprise three-song EP titled Roll the Dice with EDM powerhouse Marshmello (the one with the marshmallow mask). The DJ meets the quartet on their level, offering production in line with the contemporary West Coast, though lacking the samples and frantic pace of some of the group’s breakout hits. Roll the Dice is SOB x RBE’s first project since last November’s Gangin II. Members Yhung T.O. (Trust Issues, Lamont “Young L” Davis) and DaBoii (Neva Lookin Back) have both released mixtapes in the months since. The new EP also extends Marshmello’s reach into hip-hop; last year, the DJ released singles with Roddy Ricch (“Project Dreams”) and the late Lil Peep (“Spotlight”). Spin recently profiled Yhung T.O. as he flirts with solo stardom. You can read that story here. Listen to Roll the Dice below. Can Yhung T.O. Be the Bay’s Pensive New Star?